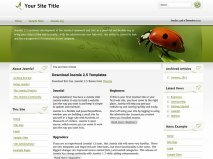 What if we told you that making a website can be easy and quick using our Joomla 2.5 themes for download? Our great selection of amazing themes for your websites is here: Business Affair Theme, Forex Trading Theme, Daily News Theme, Real Estate Theme, Web Hosting Theme, Feel the Music Theme, Back to Nature Theme, Mobile Solutions Theme, Computer Society Theme. Are you willing to help your company grow faster, show your products online, make your own web gallery with your pieces of art, upload videos, start and important blog, or just make a fun website? This is the best place to start, because our themes are just a click away. All of them are easy to install and adapt to the kind of site you want to build, but if you have some difficulties, just follow the manual that comes with each of them. You will find yourself navigating your site quick and painless with the user-friendly admin panel, where you can easily set up the color scheme of your choice, put up your company’s logo, upload news in the form of pictures, text or videos, and many other things. Our themes are compatible with the top browsers on the market, so your users will have access to your content no matter what platform they are using.